Judge Andreas Voss stayed the suit that claims Samsung infringed on a photo gallery page-flipping patent in lieu of the conclusion to a concurrent invalidation proceeding at the Federal Patent Court, reports FOSS Patents' Florian Mueller. Mueller notes that regional courts in Germany stay patent infringement suits only if the defendant demonstrates a high probability of the property being invalidated. 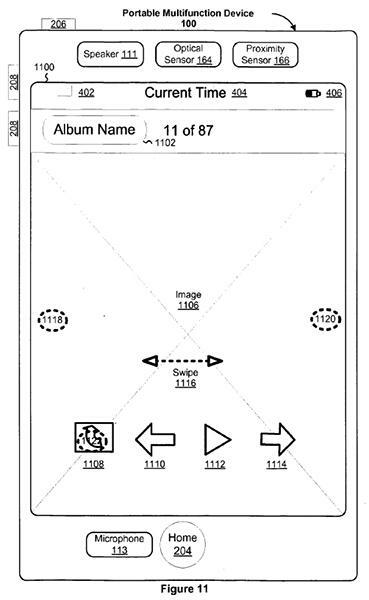 In the suit, Apple is asserting European Patent 2059868 on a "portable electronic device for photo management," which covers the manipulation of digital objects on a screen with a physical object such as a finger. The patent was successfully used against Samsung in 2011 Dutch case that saw the European ban of infringing products Galaxy S, Galaxy S II and Ace. Motorola was also hit by the patent in March in a Munich proceeding that resulted in the injunction of a number of devices. Both Samsung and Motorola have since found workarounds to the photo-viewing solutiion. Apple's Mannheim suit may not be a knockout blow to Samsung or Android, but a win would further delineate the user interface differences between iOS and Google's OS. "All of these Apple patent lawsuits are increasingly making (and maintaining) a difference," Mueller writes. "However, since those patents aren't standard-essential, they don't have the one-bullet-to-kill effect touted by Motorola." Mueller is referring to certain wireless FRAND patents held by Motorola that, if successfully leveraged against competitors, could cause significant financial setbacks to an infringing company. One of the most prominent cases of fallout from these standard-essential patent claims is the current ban on Apple's iCloud push services in Germany. The Mannheim court had a separate Apple vs. Samsung case involving a pinch-to-zoom patent scheduled for ruling on Friday, but that suit was suspended until next week due to internal delays. Apple and Samsung are slated to meet for court-mandated settlement talks on May 21-22 which could bring some resolution to the worldwide patent battle between the two electronic giants that now spans over 10 countries.